The trip my friends and I talked about 5 years ago was finally happening. However, I will be doing it solo. Doing such a long trip requires big financial preparation and commitment. It is difficult to find people who are committed to it as we all have different priorities and expectation of travelling. Days preceding the trip was crazily hectic. I was knackered from running errands, getting my visas sorted and catching up with friends. The only time for a break was when I leave for the trip. Friends and family gathered at my block. My MP, Pritam Singh was also there to send me off. It was not a cheery sent off party with waving pom poms. The mood was awkwardly solemn. My family and I were hugging in tears. I could not bear the sight of my mum crying, the most. I kissed my dog on his forehead as I always do. It may be the last time I am seeing my canine companion of 13 years old. He was diagnosed with heart problem a few months back. I do not know how many years he have left and I was unsure when I will be back. The ones I will be missing the most while travelling. Friends who came to send me off. Some I met for the first time. Thank you for your presence. 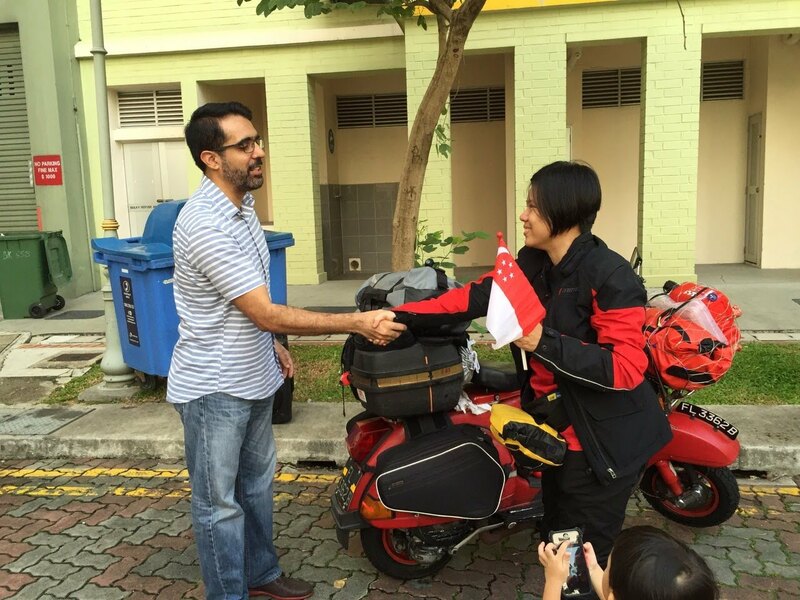 It is an honour to have Mr Pritam Singh presenting me a Singapore flag. Letting go was the hardest. Before any of the these changes my mind, I started my scooter and went on my way. Bunch of friends accompanied me until Yong Peng where we stopped for lunch. Along the way, my scooter had difficulty breathing because of the new air filter I installed. It was running fine after I changed it. With Eric and Lynette in Malacca. First stop was Malacca where, I met Aimpro Ah Long for dinner. 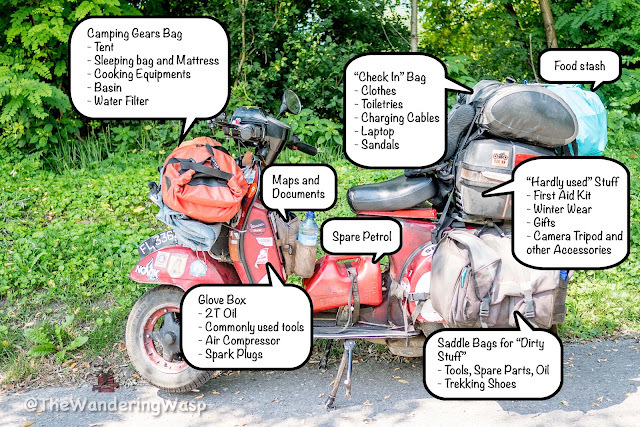 He has ridden his VBB from Chennai India to Pakistan, Iran and then shipped it to Dubai. We exchanged information about border crossings and touring. Before I left, I told everybody, I am travelling solo but will never be alone. 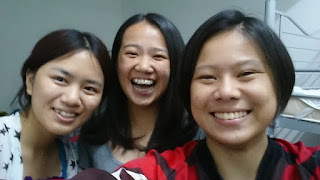 The first friends (from China and Taiwan) I made at The Cardamom Hostel in Malacca. We chatted and shared fruits. With the CBX 750 and HOG guys. Ah Long accompanied me to Ipoh the next day. His scooter had problem with the clutch mid way. Seeing a Vespa scooter lying on its side by the highway, Jason, who happened to ride past, was shocked. He knows about my trip and for a moment thought an accident happened to me. A few calls later, we went to the next town and picked up a Yamaha scooter to continue the journey to Ipoh. We stopped by KL to have dinner with Jayson and his son. Later, we also visited Vespa Planet where I met Shauki and Harley ladies. Over tea, Shauki said he will ask his friends to help me in Hatyai when I arrive there. Lunch with Jayson and his son. At Vespa Planet with the Harley Ladies. A gift from Vespa Planet which comes very useful. Thank you. 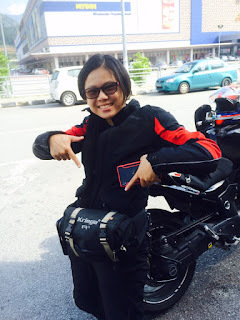 In Ipoh, I was warmly hosted by Anita Yusof, an avid motorcycle traveller who is the first Malaysian woman to ride 5 Central Asia Countries solo. She shared her valuable advices and experiences from the travels as a solo woman. Ah Long decided at the last minute to accompany to Penang the next day so he stayed at a budget hotel nearby. It was an honour to meet her. Terry from KL whom I have been chatting with for the past year, met me for first time over breakfast in Ipoh. After chatting online for one year, face-to-face conversations was much more efficient. Before parting ways, he offered to exchange his Kriega waist pouch with my Overboard waist pouch. He also passed me a pepper spray for protection. "I don't think your waist pouch can last. I don't know what I can give you for the trip, but I can offer you this." With new breakfast khaki, Terry. My new waist pouch. I have not heard of Kriega but I was later told they are solid stuff. Sungei Perak Arah Utara - this place used to be the Vespa Village. On the way to Penang, my scooter engine sounded unusual and there was not enough smoke from my scooter. We stopped by Kulim and met Rusty Scoot aka Roslan to get my scooter rectified. Two years ago, Rusty Scoot and I briefly met in Penang by chance during a road trip. This time round, I need his help. It turns out that my piston and block are badly scratched. It did not happened recently, it has been happening for some time. My 2T pump had some issues previously but it was not correctly rectified by the mechanic, all he did was to change the pump hose, which was not where the problem lies. I continued riding and felt that the pump was still not working. I decided to go “premix”. My premix is still not enough. Before I left for my trip, I did asked the mechanic to service my scooter and also to check the piston and block as I suspected there may be scratches. I was told it is fine. Lesson one – Do not be stingy with 2T, better to foul a spark plug than to seize the piston. Lesson two – do not trust your mechanic’s word 100% unless you have seen the engine stripped down before you. 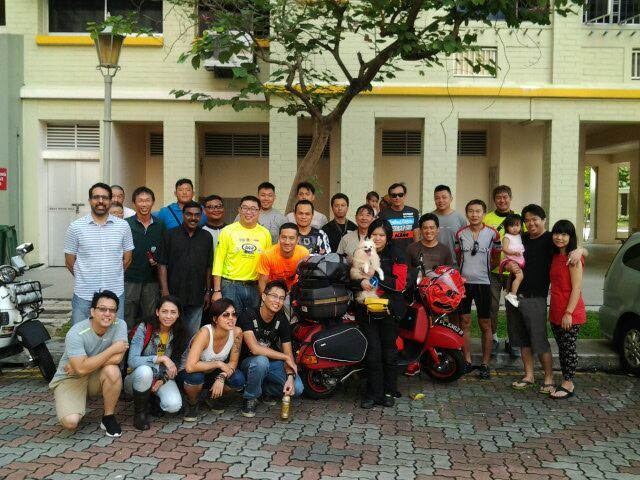 To many Vespa mechanics in Singapore, as long as the scooter moves, it is ok. They do not understand the crazy extent I will be riding it and the condition I need it to be in. Roslan worked on my scooter until late at night. He gave me his piston and block from his own scooter, plus another spare piston and block. 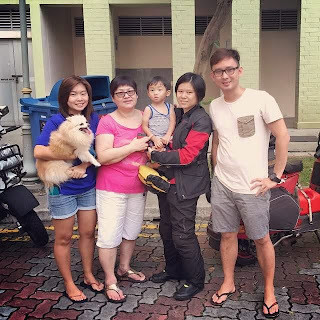 As it was late by the time he finished working on my scooter, Roslan put me up at his home for the night and refused any payment for the work done. "Return me when you come back. I just want you to complete the trip." A late dinner after my scooter was fixed. With Roslan and his wife. Ah Long and I parted ways at Kulim, he rode back to Tampin in the wee hours, only arriving home at 6am the following day. He has a meeting to attend that morning as well. I was absolutely touched by the kindness that Ah Long and Roslan had shown me. Both times when I had to say good bye to them, tears of gratitude just welled up in my eyes. I am a lucky lass (pun intended) to have so many people who went out of the way to help me. At Penang, Dickie, also a fellow Vespa rider, put me up at his cosy guesthouse Bahari 28. We went to Dickie's warehouse where he keeps antiques and refurbish old furnitures. With the Vespa peeps of Penang. This is the first time I have it served in a cup. With Mabel, another young Vespa rider and Dickie. Listening to the Hokkien spoken by Mabel and Dickie, it is interesting to note how the dialect of Chinese diaspora have changed after they left China. Their Hokkien is mutually intellgible yet sound less harsh than the one spoken in Singapore. Accompanied by Ang and Syukur to Sadao. Ang applied leave to accompany me for the ride. It will be so cool to meet on the road again. The world for travellers is very small. Such an inspiration! Im planning a world trip as well sometime. 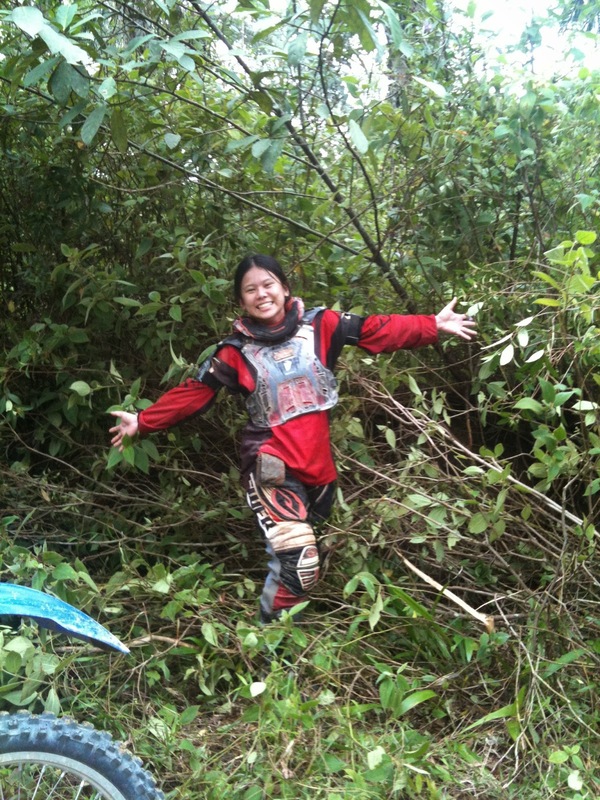 I just finished motorbiking Vietnam, quite the exciting experience. my blog is www.fourminutes.com - check it out! 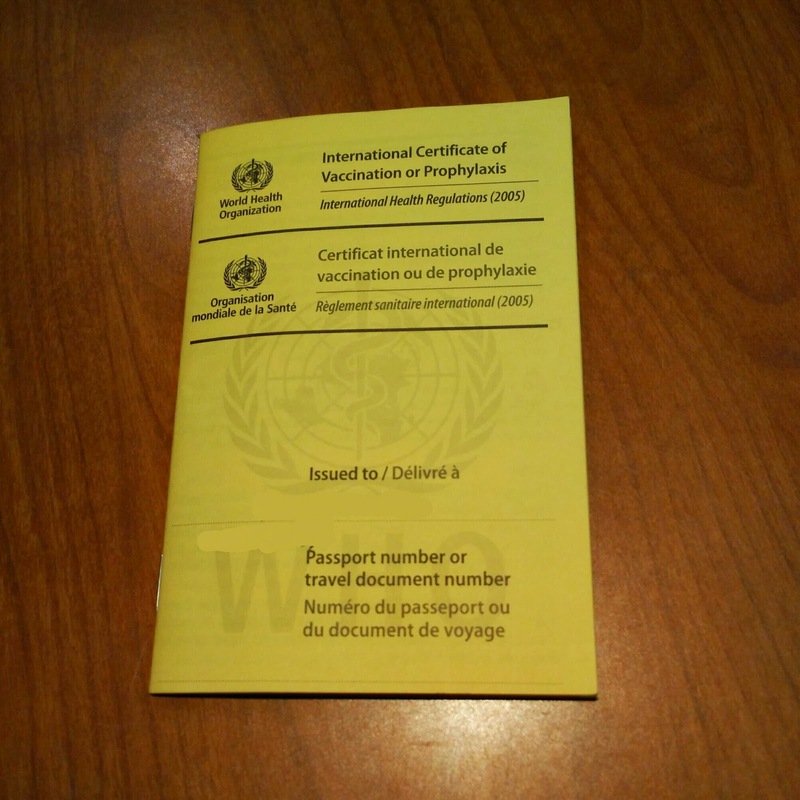 Guess what; this blog is bookmarked and will be my favourite reading to pastime! Keep the miles high and best of luck in your journey Juvena! I do not know how many years he have left . I'M AN EX BIG MAFIA MONEY LAUNDERER: STUART NEWBY FROM MONACO. EX KLEINWORT BENSON LONDON. THEN MONTANI MONACO. AS I JUST SAID, I'M AN EX ENORMOUS MAFIA'S MONEY LAUNDERER ( HERE WHILE I TRIED TO RENT A VILLA PURCHASED BY A VERY ASSASSIN MAFIOSO FROM NAPLES, WHOSE KILLING MONEY I LAUNDERED FOR DECADES IN COTE D'AZUR https://www.stayonedegree.com/en/home/137/information/view ANYWAY, I WASHED MOUNTAINS OF EXTREMELY DIRTY MONEY, IN MY LIFE, IN LONDON, IN SINGAPORE, IN HONG KONG WITH VERY WELL KNOWN CRIMINAL MICHAEL CHINNICK FROM MANDARIN CAPITAL, EX MORGAN STANLEY LONDON AND HONG KONG, VERY VERY WELL KNOWN CRIMINAL MATTHEW HOLLAND EX MORGAN STANLEY LONDON AND HONG KONG AND VERY VERY VERY VERY VERY VERY.. EXTREMELY WELL KNOWN CRIMINAL DANIEL HEGGLIN ALSO EX MORGAN STANLEY LONDON AND NEW YORK).